Discussion in 'Discussion (Beta Versions)' started by d0x, Jun 27, 2018. I installed the latest build of the Windows beta and it broke quite a few things gaming related. First it broke "teredo" which is the UWP Xbox app for Windows that allows you to chat, form parties etc. If you go to the apps settings>network and run a test (which is usually to check connection speed, Nat status etc it will fail everything and give you a toreto error. Then I was playing Forza Horizon 3 & Forza 7, both UWP games and in both games any time I tried to play multiplayer it would fail to connect. Then I had issues with Uplay games. I kept losing connection and being dropped from games in Ghost Recon Wildlands and in Rainbow Six Siege I kept getting and error that "one player in the party can't connect" so I couldn't play at all. I tried shutting protection off but it did not help. I tried shutting off essentially every setting and it didn't help. The only thing that would fix it was an uninstall of the app. I didn't have any of these issues with the previous builds and I don't know what change was made to adguard that's causing this but hopefully it can be fixed. @d0x was it possible that it was a compatibility issue? Do you have any antiviruses installed? Nothing besides Windows Defender which I did think of and disabled then rebooted and the issue kept happening. I installed the previous version of adguard beta after figuring this out and everything worked fine again. So just to confirm i updated to the latest beta again then tried all the stuff listed in the original post and once again the issue returned. Toreto? Do you mean Teredo? So, about those ubisoft games, you use uplay app, not steam, right? 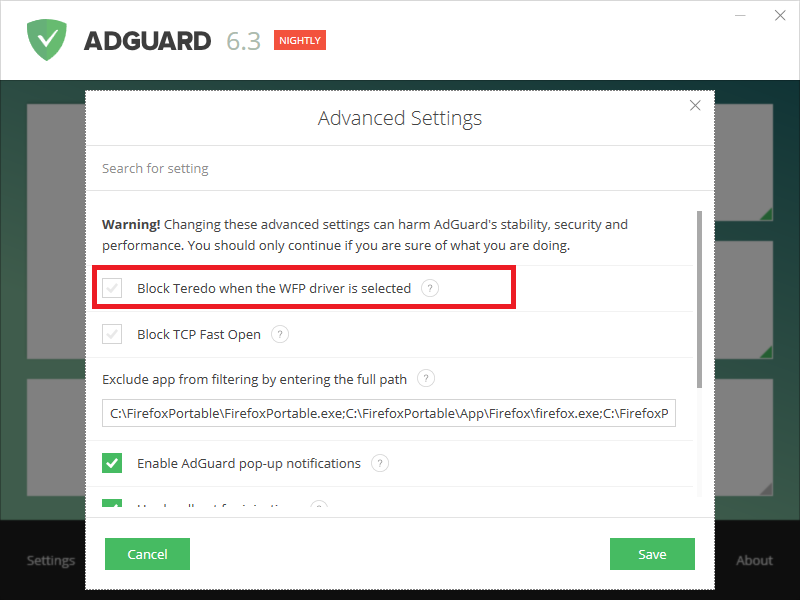 Try switching driver in Adguard's network settings. You will have to excuse autocorrect but yes I do. As for the Ubi soft games, it doesn't matter if you bought them on steam or uplay it always launches and uses Uplay. That being said Ghost Recon was bought via Uplay and R6 Siege was bought via Steam. It wasn't just Ubi soft games that didn't work though nor was it just UWP based games. I just didn't think I needed to list every single game I tried to play and had an issue with due to how many things I tested but I'll list a few more that use various different services from Uplay, Microsoft/Xbox live servers, steam, and origin. All tested with Adguard protection enabled and disabled as well as Defender disabled. @aegis, I did try switching the driver in the adguard settings. I also tried disabling everything except filtering in chrome by not only shutting every option of the program off and rebooting but also by going into Adguard's app filtering selection list and unchecking everything except for chrome then rebooting and trying and when that didn't work I uninstalled adguard and everything immediately worked again. Then I went back to the previous beta build and everything worked fine. Then to reconfirm (before I posted here) I installed the latest build we were informed about via email and everything immediately stopped working again. I should also add that I checked and made sure all the games and services were up and running fine and I also had no issue playing them on a second identical (aside from gpu) pc that doesn't have Adguard installed. There you can uncheck the box for the option that blocks Teredo (highlighted in the red box in the below screenshot) and hit Save, and then reboot your PC. It *should* work fine then, but keep in mind there's a chance BSODs may occur (due to Teredo being buggy and/or application incompatibilities). I don't use torrents. I've been using adguard on Win10 with the same settings for months without issue, why would it suddenly start blocking teredo which is required for xbox/uwp games to work properly? It's also a core part of the Xbox uwp app and required for party chat. Forgetting teredo for a minute why would all the non UWP games that don't use teredo stop working properly? I've never had an issue with any game (as long as their servers were up) until I installed this latest beta build and again the prior beta build works perfectly fine with all default installation options checked. It's very bizzare and has to be something else. There must have been a change in the program that is causing this. I don't know if it matters but I'm on build 1803 of win10. Could there be a compatibility issue with Adguard here? Not sure, but if it works in the latest beta/RC build after disabling the block Teredo option, then something must of changed, not sure. I don't run torrents either, so I have the block Teredo option disabled. Something has definitely changed, I just tested it and it still doesn't work. @d0x what exactly have you just tried, could you please give me the steps to reproduce? Install latest beta build on Win10 1803, disable block teredo. Open a UWP game that has multiplayer like Forza and try to play mutiplayer. Or other games and try to play multiplayer. You might connect but then you get randomly kicked or it might fail during matchmaking. Also the Xbox app might give you an error about parties/chat. Also go to settings>network then run the test and it fails and gives a teredo error. Then if you open a command prompt and enter the commands to check the status of teredo it will say it's not working and the commands via the command prompt window to get it running don't work. Hmm, that's odd. I enabled the block option and it Teredo is disabled system-wide (checking Teredo's status via the Command Prompt). I disable the block option and it re-enables Teredo (again checking Teredo's status via the Command Prompt). Wonder if one of the AG team/devs have any ideas? Are you on 1803? It could also be a difference in hardware, firmware, drivers... I don't know. Yes I am, always using the latest Windows 10 update. I'll see what happens in my test virtual machine later. Try re-enabling Teredo manually after that. Do you think trying different revisions of network adapter drivers would be worth a shot? As for the teredo commands I've already run all of them, literally all of them but ty.